Microsoft tried to convince PopCap it was only worth $5 million, but the studio didn't believe it. PopCap Games, the company behind titles such as Bejeweled, Peggle, and Plants vs. Zombies, could be basking under the Microsoft umbrella right now if it didn't have enough business moxie in its earlier days. Somewhere around eight years ago, Microsoft made an attempt to purchase PopCap, but evidently not a very good one. Jason Kapalka spoke to Develop about the constant offers that PopCap gets from investors, and his reluctance to go forward with any of them. When Microsoft tried its hand, it wasn't so much reluctance that caused the offer to be denied as good business sense. "We had a couple of funny instances in the early years of PopCap where we were talking to Microsoft about a possible acquisition," he said. "I think it was in 2002, and they sat us down and gave us this long speech about why our company was worth $5 million, at a time when we had $4 million in the bank." PopCap was founded in 2000. 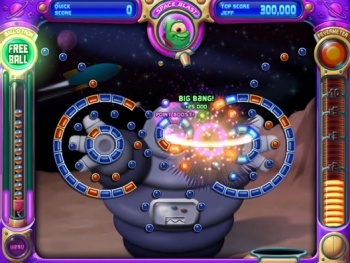 The company's release of Bejeweled in 2001 was the start of a lengthy profitable life in the casual games market that has seen tens of millions of downloads across multiple games. Microsoft was trying to get in on its action early. Kapalka continued: "We didn't know much about stock prices and business valuations at the time, but it really didn't sound like a very good deal even then." I would say it definitely wasn't a very good deal at all, considering future offers other companies made for PopCap. Kapalka revealed that just a couple of years later in 2004, PopCap was offered $100 million, though the deal didn't work out "for other reasons." PopCap really isn't in any hurry to be bought out. Kapalka said the company doesn't want to work with people it "wouldn't be happy with for the next four years." PopCap is profitable, so he appears reluctant to take the chance of ruining a good thing. Independence is often worth more than a few million, when you're already raking in a few million of your own.